View More In Child Carrier Trailers. This sleek product is ideal for the avid user or occasional cruiser with great taste. It features a suspension system, UV protected windows, and deluxe padded seating. The ride is seamless for twins, a bag of local produce, or your three-year-old and her favorite invisible friend. This kit comes with 2-Wheel Stroller Kit. This sleek product is ideal for the avid user or occasional cruiser with great taste. It features a suspension system, UV protected windows, and deluxe padded seating. The ride is seamless for twins, a bag of local produce, or your three-year-old and her favorite invisible friend. All of Burley?s child trailers are designed and tested to exceed ASTM F1975-09 standards, making them both safe and highly durable. Every trailer features anodized aluminum frame tubes and hinges, a forged alloy hitch, and 600D polyester cover and seat fabric. This kit comes with a 2-wheel stroller kit. 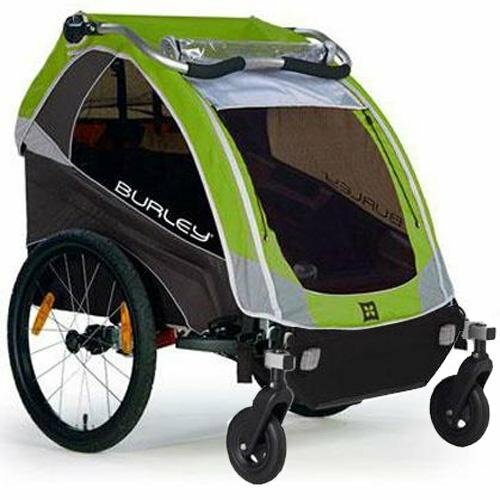 The Burley Stroller Kit easily converts the DLite Burley trailers into a stable sturdy stroller with the simple turn of a knob Once installed the Stroller is always with you when you re biking. and you?re always ready to walk or roll! Features: 100 pound capacity. 5-point harness. Removable, washable seat pad & shoulder harness. Reclining seat. Stow away sunshade. Tinted, UV protected windows. Reflective material on all sides. Front, rear, & wheel reflectors. Parking brake. Elastomer suspension system. 20 inch black alloy push button wheels. If you have any questions about this product by Burley Design, contact us by completing and submitting the form below. If you are looking for a specif part number, please include it with your message.